We talked to the women behind the film. Mary Reynolds pictured with her garden in 2002. IF YOU EVER thought a mid-life career change was an impossibility, then Vivienne De Courcy’s story will convince of how wrong that assumption is. The former corporate finance employee has just released her first film – and it’s also a rather inspiring tale, that of an Irish gardener (Mary Reynolds) who despite many odds stacked against her won the Chelsea Flower Show in 2002. The film, written and directed by De Courcy and starring Emma Greenwell (Love and Friendship) as Wexford native Reynolds, also hopes to spread the message to viewers about the importance of looking after our wild habitats. No small task then, for a debut movie. Reynolds was 28 when her Celtic creation won a gold medal at Chelsea – making her the youngest winner ever. She managed it despite not having the £150k sponsorship needed – and had to go to Africa to convince Christy Collard, who is played by Tom Hughes (currently starring in the TV series Victoria) to work with her. Their love affair is at the heart of the film, which takes a very romantic look at what happened. Both Collard and Reynolds are still gardeners - he is behind Future Forests, an environmental project in Ethiopia, while Reynolds is a designer and writer. De Courcy currently lives in London, but has a house in west Cork. She says her passion for wild places and natural habitats runs right back to her childhood, when she would go on nature study walks with her father, “a fossil book in one pocket and wild flower book in the other”. She has been writing screenplays for years – 15 at last count – including two science fiction epics which were written in the 1990s. They’re not too far from her debut film, though – they were both based on Gaia theory, which posits that the world is a ‘superorganism’. She met Reynolds when she hired her to design her garden in west Cork. She “rocked up with a lot of attitude and tulle dress dragging around mud in the building site”. The pair were “very much philosophically aligned”, says De Courcy. It’s not that often that we see films about landscape gardening, with, you’d argue, good reason. “When Viv said she wanted to do it she hadn’t made films before so in a way I didn’t take her seriously,” says Reynolds. And I said ‘off you go no bother’, and I had no idea that she was a force of nature and that once she decided to do something there was no stopping her. And she held the integrity of the story so well that I was happy to go along with it. She made a beautiful film and it’s a pretty impressive feat or someone who’d never made a film before and who’s decided to become a filmmaker on her own, untrained. Reynolds says that her youth didn’t hold her back when it came to taking part in the Chelsea Flower Show. “I never had any feeling that ‘you are a girl, you have restrictions’, anything like that,” she says. “I don’t know how I managed to avoid feeling like there were limits. It’s also a lot to do with naivety you know, before life knocks you back. It never occurred to me to fail. I always knew it was part of my destiny to do that thing. De Courcy spent 20 years working in the USA in corporate finance. When her daughter was small, she would go to work very early in the morning, finish by two and then write for two hours. She started to sit down and give time to her work. “It became just a joy to me,” she says now. Her first script, Orchid Eater, was optioned by two Hollywood companies, but never got made. She says that aside from gardening, Dare to be Wild is ”also about romance – what should girls who are driven do in terms of the men they have to encounter and need but also fall in love with”. She needs him and falls in love with him she’s fragile and vulnerable and tough and resilient, and bewildered and frightened a lot of the time. Watching the film wasn’t difficult for Reynolds – she even watched with the real-life Charlie Collard, which was “weird” but fine. Reynolds moved back to Wexford three years ago, and has since written a book called The Garden Awakening, which she describes as “my life’s work”. She’s now a garden designer who sees herself as “of service to nature as opposed to one who would impose their own vision on nature”. It’s somewhat ironic, then, that she started studying landscape design because she fancied a guy on the course. She ended up setting up her own business, designed gardens until she got a bit sick of it, and then moved back to the countryside, where she connected with nature once again. She says she still has the motivation, but has “no interest in making loads of money I just want to make enough money to make a home for me and the kids so I can teach people to work with land”. De Courcy wanted Dare To Be Wild “to look like the sunburst landscape” in Ireland. “What I didn’t want was another sepia-tinged blue grey misted Irish film,” she says. I guess what I really wanted was for people to feel the beauty of wild nature. For me wild nature is the star of the film and people do feel that. She and Reynolds also want people to examine after the film how they can contribute to caring for nature around them. “I think most people feel pretty powerless, people who actually care about the planet and care about the future of their children and other people other than themselves,” says Reynolds. But for her, the solution is, well, gardening. 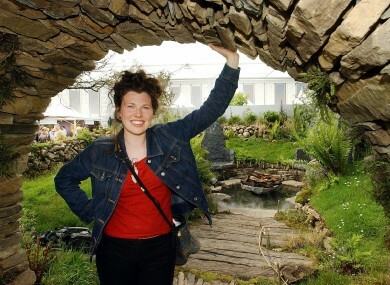 Email “"It never occurred to me to fail": Irish Chelsea Flower Show winner has her inspiring tale turned into a movie”. Feedback on “"It never occurred to me to fail": Irish Chelsea Flower Show winner has her inspiring tale turned into a movie”.